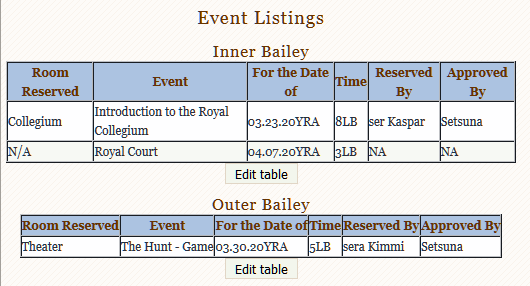 The following file (( ooc: http://wiki.marrach.skotos.net/bin/v...omReservations )) can be requested for update at any time by sending a scroll to me, Scribe Setsuna, with request of date/time/location for your event. Please note that this request is not for regular weekly bells. This is for one-time events (balls, special tournaments, etc) that require planning ahead of time. As such, we request that you send these reservations as early as possible in order to ensure the room is reserved. Space is on a first come, first serve basis, but rank will hold precedence as always. This posting will contain events of the moon, and be updated every moon, and as events are added. Current Events listed for the coming Moons. These are not our posting of weekly bells. If you have an event that is not listed here, please contact myself so that I may update the posting. All times are GMT-8. This page was generated at 08:32 AM.